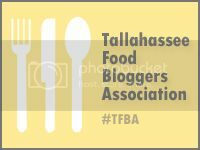 Tallahassee appears to be finally getting the trendy restaurants that have been spreading around the country. The Food Trucks have arrived, the fancy hotdog place has opened, and now a fancy hamburger joint. Vertigo Burgers and Fries was recently opened by the Cypress folks, a haute Southern restaurant here in Tallahassee. You can tell a lot of thought and effort was put into creating the different topping options, and to use locally sourced, quality ingredients. 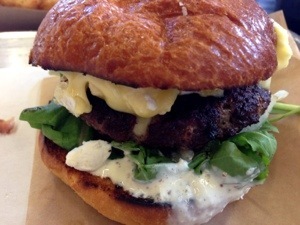 I got the “Round Here” burger that is KBH Farms grass-fed beef burger, SGD green hill cheese, Vidalia onions, locally farmed arugula, and vertigo sauce. This was a gorgeous burger and I loved the toppings. Unfortunately, the burger was past medium toward well done. The restaurant has a sign at the counter saying that all burgers are cooked medium, which I can appreciate. However, if I can’t order medium-rare, then at least cook it correctly at medium. And with grass-fed beef I would definitely have prefered medium rare to really taste the beef. 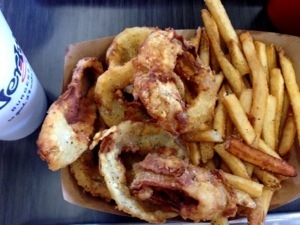 On a high note, the onion rings were probably the best I have had in Tallahassee commercially. On a low note, the fries were far from crispy although they looked good. Even the more browned fries were limp. I feel like if you are going to have “Fries” in the title of your restaurant, they need to have just as much care and thought as the burgers. I’m not going to rate them on Urbanspoon since they don’t have a “Meh” option, but maybe they will improve as they are a pretty new establishment. I plan on trying again in six months, and will revise this post if they have settled in and brought up the quality. If the burger and the fries are spectacular, then no one cares about the rest. I think I was more disappointed than anything, especially with the concept and topping combinations being so intriguing. I don’t understand how they can continue to push out mediocre stuff at those prices. Great review! Didn’t realize they served grass fed beef. We’ll have to give them a try!